We welcome you in the name of our risen Lord and Savior, Jesus Christ! At St. Mark's, we have the mission of sharing the good news of Jesus' love with others and therefore we would enjoy having you visit us and join in our worship service. While here at our website, take a look around, get to know more about St. Mark's and maybe set aside a date to come and visit us. Also, check our site often as we are continually updating content. -Sunday - 8:00 a.m. & 10:30 a.m. September thru May. - Sunday Summer Worship - 8:00 a.m. & 9:30 a.m. June thru August. -Sunday School & Adult Bible Study 9:15 a.m. September thru May. 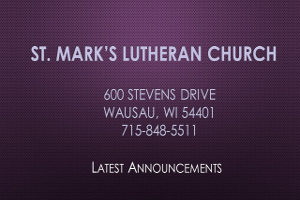 St. Mark's Lutheran Church, 600 Stevens Dr., Wausau, WI 54401. Office: 715-848-5511. Click for directions. 11:00 AM Tuesday Mornings, 6:00 PM Wednesday Evenings, and 7:00 AM Thursday Mornings. You can also view our sermons online. - July 15th thru July 19th - St. Mark's is already getting ready for VBS 2019. This years theme is, "Roar - Life is wild, God is good!" To find out more, go to our VBS 2019 page. 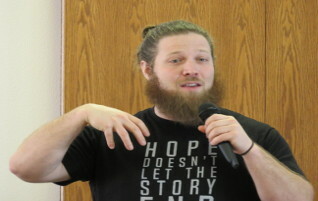 - March 17th - On Sunday, March 17th, we began a Bible study on Jesus' "Sermon on the Mount" which is also the basis for our Wednesday Lenten services this year. This Bible study is intended to supplement our Lenten services. Come and join us for coffee, treats, and the study of God's Word. - Ongoing - Are you a college student or do you have a child in college? Would you like to keep updated with information from St. Mark's while at college? If so, please contact Donna Schroeder of the Lay Ministry and provide an email address where we can send you important information from St. Mark's. - Ongoing - Preschool enrollment for the 2019 - 2020 school year is now open. Registration forms can be picked up in the church office or you can click here for a registration form. You can get more information about session and fees here. Click here for our complete church calendar. 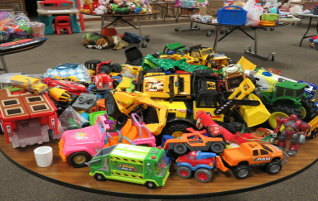 On Friday, December 7th, the Men In Action held their annual Christmas Toy Give Away! 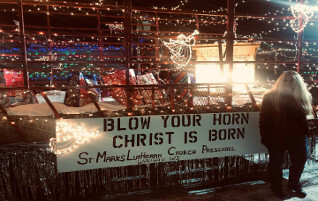 St. Mark's Preschool was in the Wausau Christmas Parade!